£26.99 seems like a good price for these. They were this price in Maplin but seem to have minimal stock left. They were £44.99 on amazon when I looked last night, so seems like a good price. Can't comment if these are any good or not as I only purchased the hub last night. Seems to be plenty of SmartThings fans on HUKD so hopefully someone can comment. I use one with a 3kw heater and have had zero issues for well over a year. Interesting to hear about the fire risk Thats the kind of thing I was trying to avoid by going for branded rather than one of the unheard of brands on amazon/ebay. Seems to mainly affect people running tumble driers/washing machines/heaters etc thru them though. Which I wouldnt have even thought of doing! For anyone not put off by the potential fire risk, they're back in stock. The samsung smart plugs are only designed for max 12A devices......a 3kw heater will have 13A minimum.....your asking for trouble! If you put a load through them greater than what they are rated for then it’s your own fault if your house burns down! 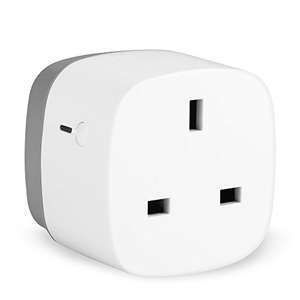 The samsung smart plugs are only designed for max 12A devices......a 3kw …The samsung smart plugs are only designed for max 12A devices......a 3kw heater will have 13A minimum.....your asking for trouble! I feel a little foolish asking this: I've got an ST Outlet and also a TP Link HS100 (13A.) Would I be right in thinking that for an electric heater (don't ask me W, it's a built in thing) it's likely to be 13A, and I'd be better off using the HS100? If you put a load through them greater than what they are rated for then …If you put a load through them greater than what they are rated for then it’s your own fault if your house burns down! Assuming that this device has a built in fuse, if the wattage was too high this should just blow the fuse as its intended to do. 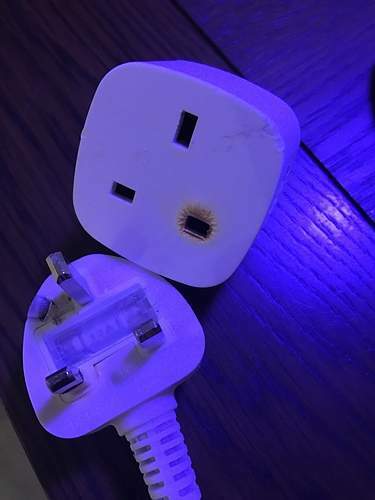 More likely its due to a poor/loose connection somewhere > creates high resistance > build up of heat > plug starts to melt. This cant be detected by the fuse so it didn't blow. Posted incase davewoodhall didn't get a notification of imran999 salient reply. I'm not using the plugs or Smartthings, just considering both. The Heiman branded door sensors from Foniacs are confirmed working with ST. The Heiman branded smart power-monitor plugs, 13A, which Foniacs have on offer should work with ST too. The Heiman devices are Z-wave, the TP-Link plugs are WiFi. It seems irresponsible to sell a device with UK connections that is rated slightly below the standard maximum rating for such connections. Not everyone is an electrical engineer and capable of knowing that 3000w is equivalent to 13A. On another topic, people keep saying "getting a hub will save you money in the long run", yet these are considered a bargain at £27, whereas the top-selling TP-Link HS100 wifi (hubless) socket is available for £20, with a range of cheaper options available. Assuming that this device has a built in fuse, if the wattage was too high …Assuming that this device has a built in fuse, if the wattage was too high this should just blow the fuse as its intended to do. 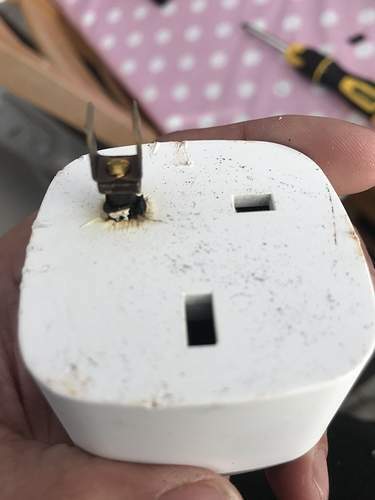 More likely its due to a poor/loose connection somewhere > creates high resistance > build up of heat > plug starts to melt.This cant be detected by the fuse so it didn't blow. I think it must be. Id be worried if everytime someone plugged in an overpowered device to an extension lead or a 3-way gang it caused a fire! I feel a little foolish asking this: I've got an ST Outlet and also a TP …I feel a little foolish asking this: I've got an ST Outlet and also a TP Link HS100 (13A.) Would I be right in thinking that for an electric heater (don't ask me W, it's a built in thing) it's likely to be 13A, and I'd be better off using the HS100? i'm pretty sure the HS100 is max rated 12amp according to the instructions. I will read up tonight. i'm pretty sure the HS100 is max rated 12amp according to the …i'm pretty sure the HS100 is max rated 12amp according to the instructions. I will read up tonight. I've checked the unit (and the website), it definitely says 13A. Just plugged in my new Samsung Smartthings Outlet and there was an electrical crackling sound. Immediately unlugged.